This tour was bad. The guide did not care about our experience. The cave and temple are very peaceful, beautiful, and interesting. However the food options are limited and we spent the majority of time in a car, at a humanity center, or in a very small boat with an unpleasant guide. - a two hour ride on a large one-lane road where you see instant death and then, big swerve, it's been avoided again. As chaotic a ride as I have ever taken. 4 hours of that 2 there, 2 back does something to you. The one hour ride on a sampan was great, as tranquil as the car ride was hectic. Also not stated in the description is that even the cable car ride is still a good 15-20 minute walk up a very steep hill. One of my family had gotten hurt the week before the trip and she had great difficulty navigating even this. So beware. The grotto itself dates back to the 5th century is pretty darn cool, but was it worth the 6 hours of traveling to get there and back? We're still debating. By far the best thing about this trip, and which actually saved it for us, was our guide, Anna. she was bright, cheery and a fountain of information about ancient and modern Vietnamese history, pop culture, Hanoi eateries, and just about everything in between. She was just so pleasant to be around, and my 19 year old daughter and her seemed to have a really good time together. Good on you, Anna! Well done! Our tour guide Anna was amazing. She was our guide the day before for the1/2 Day Hanoi tour so we were fortunate that coincidentally she was our guide for the Perfume Pagoda She is knowledgeable about the destinations and easy to understand and passionate about her job. Great day. The Perfume Pagoda was very impressive. Since we went during Tet Festival time, when many Vietnamese make a pilgrimage here, it was very crowded. We were about the only non Asians so were quite the celebrities, but everyone was nice and yelling hello to us. Our guide, Frank, was very knowledgable, not only about what we were seeing, but about Vietnam, Vietnamese culture, and even world politics and economics as they relatd to and impacted Vietnam. This was an awesome tour and a great company to work with. Rose picked us up at the hotel bright and early. She made sure we had everything we needed and took us in a lovely air con van to where we needed to pick up the boat. The ride is about 2.5 hours and it goes very fast learning about her country and the places you drive thru. 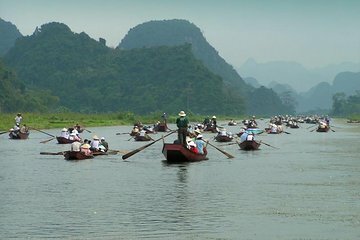 Once we arrived our row boat picked us up and took us on a 45 minute ride up the river to the Pagoda's . The water is like glass and the scenery is breathtaking . It was raining a bit so our guide made sure we had a covered boat to make our trip extremely pleasant. Once we arrive Rose took us thru each step giving amazing historical information and sharing old tales and myths aside of explaining the religion. We had a wonderful lunch between pagodas and honestly there was too much food you didnt know what to try first. Our guide really made the tour very special for us and I would highly recommend anyone going to the Perfume Pagoda to book with Rose if you want a real once in a life time experience.